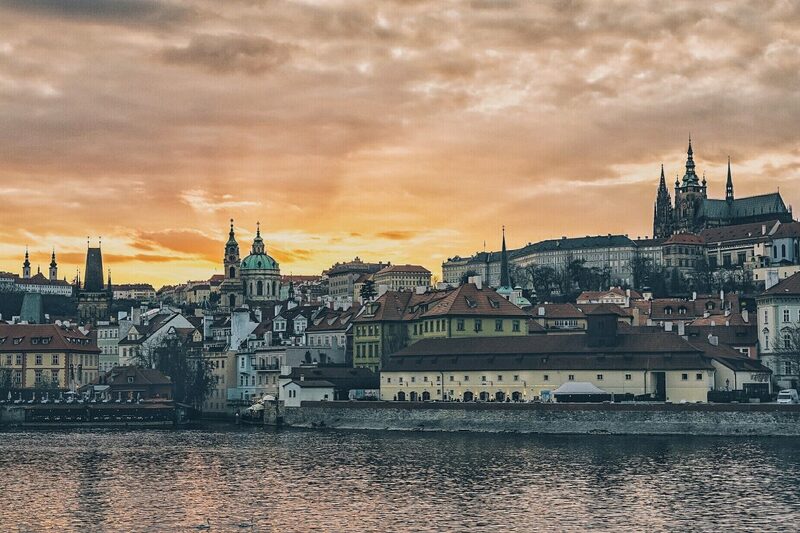 You’ll want to move to Prague after you see these photos. You’ve been warned! 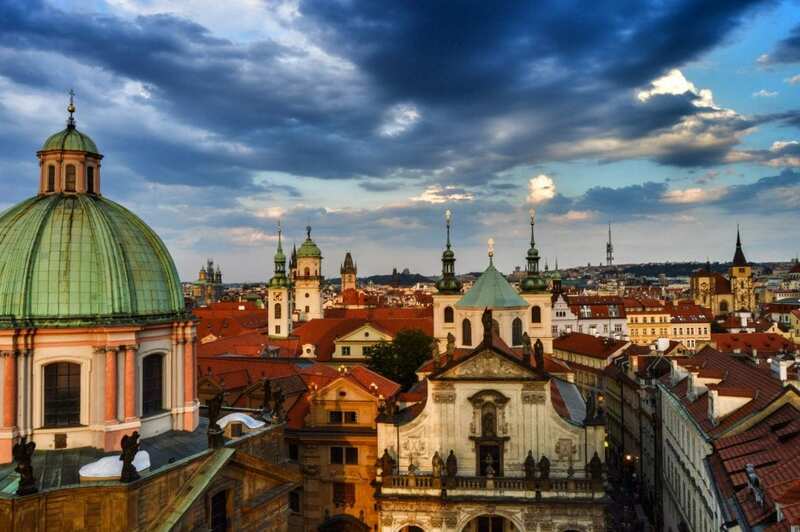 There are many cities in the world, but only one of them is Prague. 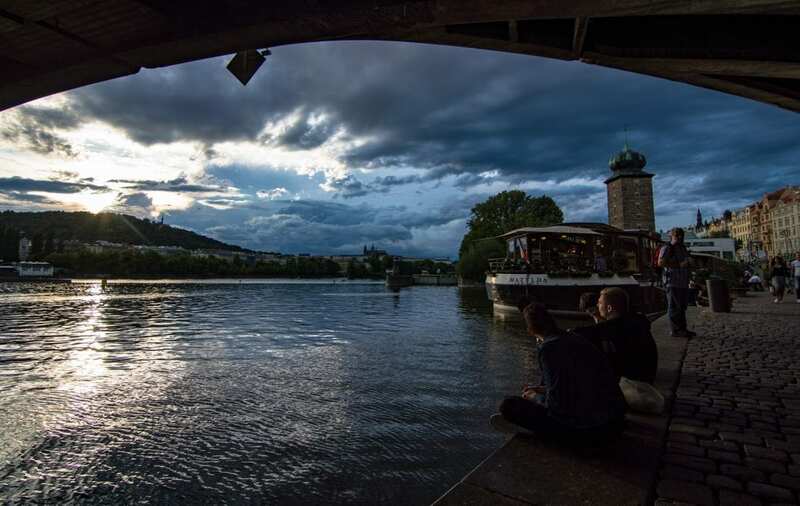 When we first arrived in Prague, in August of 2014, we were immediately smitten. 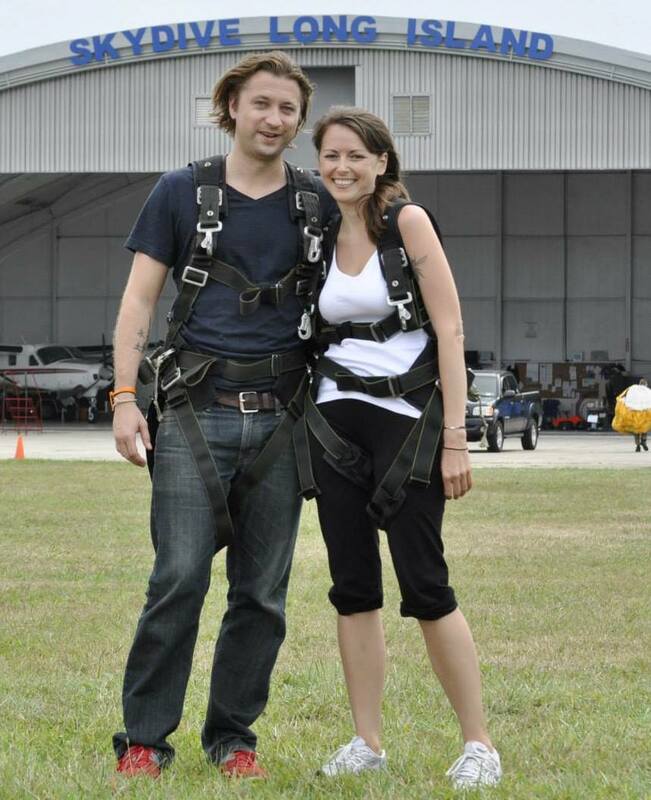 The city was gorgeous, laid back, easy to navigate and we felt extremely comfortable there. We left Prague two weeks later, vowing to return. It took us another year to circle back to Prague, but return we did. 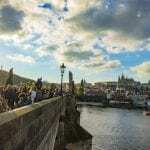 Our goal was to stay for a month and explore the city, and the Czech Republic, in a more intimate fashion. And then a funny thing happened. As the days passed we found ourselves counting down. So we stayed. We rented an apartment in the lovely neighborhood of Vinohrady, and made Prague our home for the next 8 months. During that time we soaked in as much as we could see and explore, both in Prague and so many other wonderful places in the Czech Republic. During that time we came to a conclusion. We were fully in love. Prague became our favorite city in the world. So we stayed for a while longer. 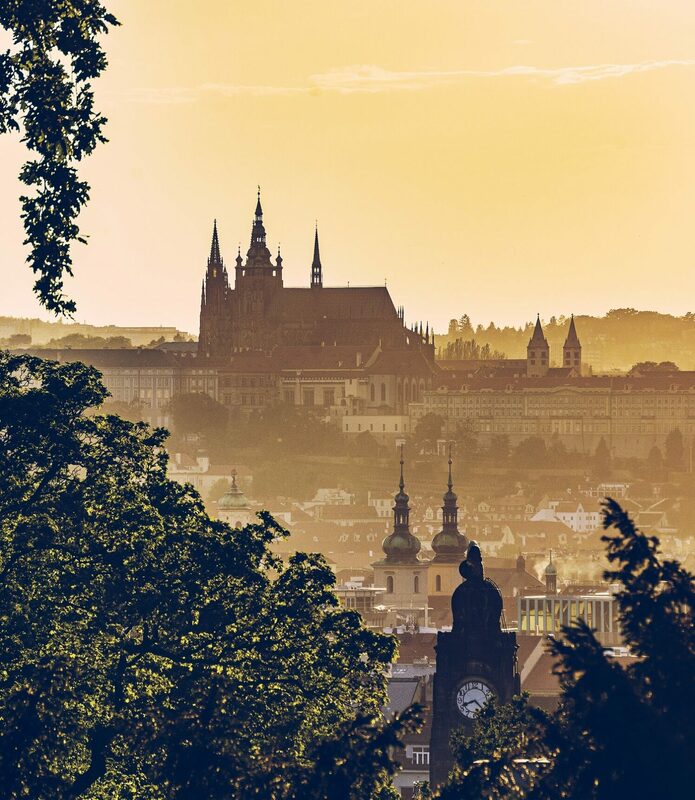 We want to bring some of the wonder and magic of Prague to the rest of the world, to showcase some of the magnificent views we were lucky enough to see. We hope these photos inspire you to pay the city a visit. 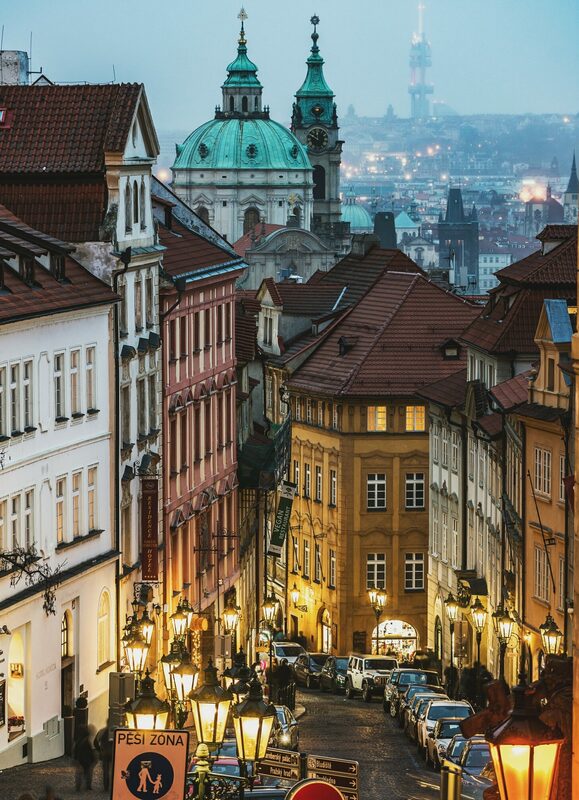 Who knows, you might fall for Prague as hard as we did. You might even consider moving there. We wouldn’t blame you at all. The above shows the neighborhoods of Vinohrady and Zizkov, as seen from the National Monument in Vitkov. We lived under a couple of those spectacular red rooftops for 12 months. Pretty neat huh? That giant metal structure in the far middle is known as the TV Tower. It hated by nearly everyone when it was erected (please excuse the horrible pun), and it’s been named the Ugliest Building in Europe on more than one occasion, but it sort of grows on you if you see it often. 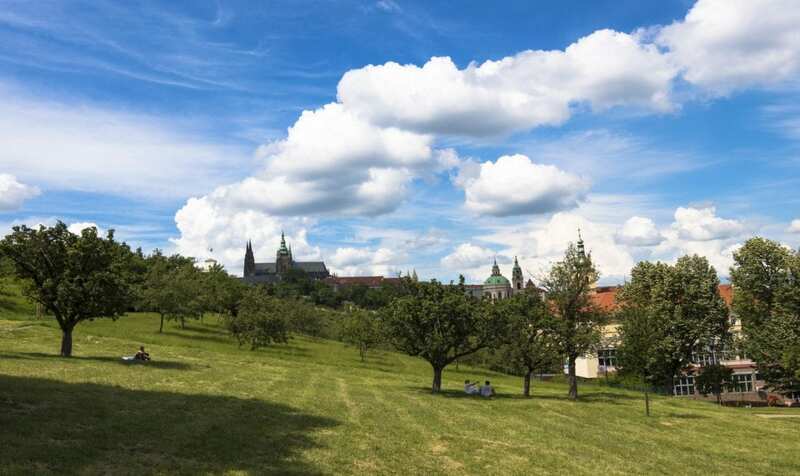 There are a ton of great parks which afford stunning views in Prague. This one is one of our favorites. 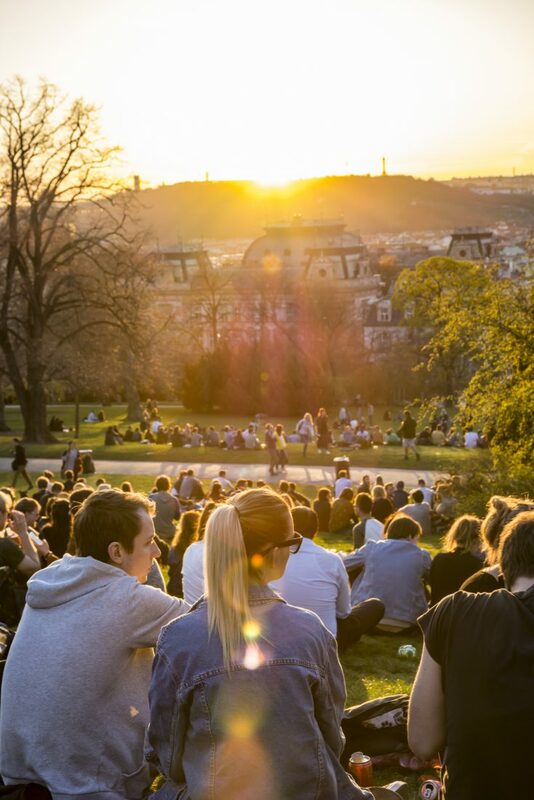 Located in Vinohrady, Riegrovy Sady was our go-to sunset spot. There are two beer gardens right next to this scenic hill, and yes, we spent a lot of time in them as well. Prague is an architecture lover’s paradise. 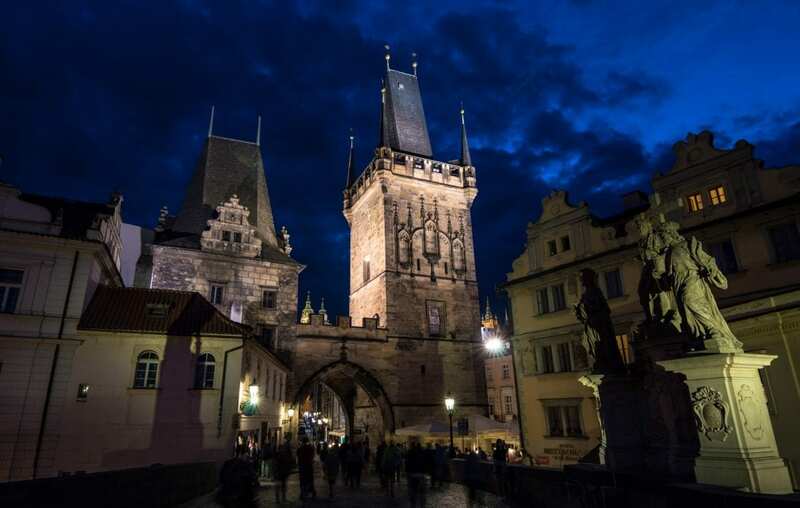 Make sure to stroll the iconic Charles Bridge at night to see this impressive sight. Do so with a significant other for a bit of Old World romance. 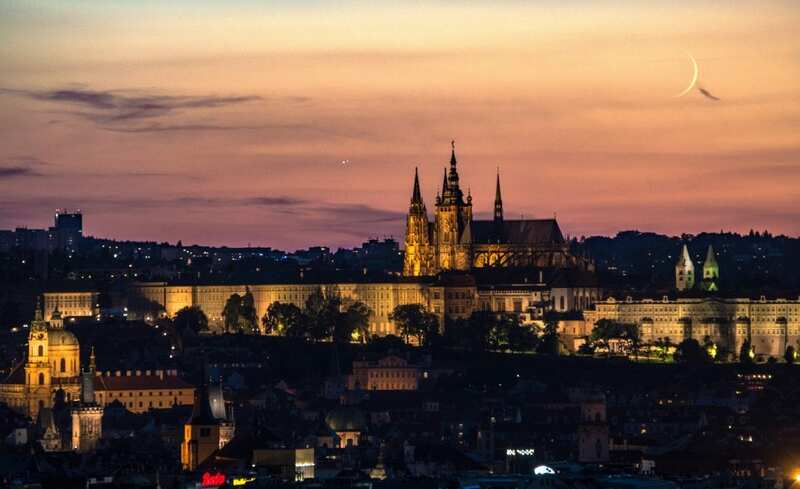 Prague is sometimes called The City of a Hundred Spires. This is an understatement. Far more more than a hundred, we reckon. At least a hundred and one spires. 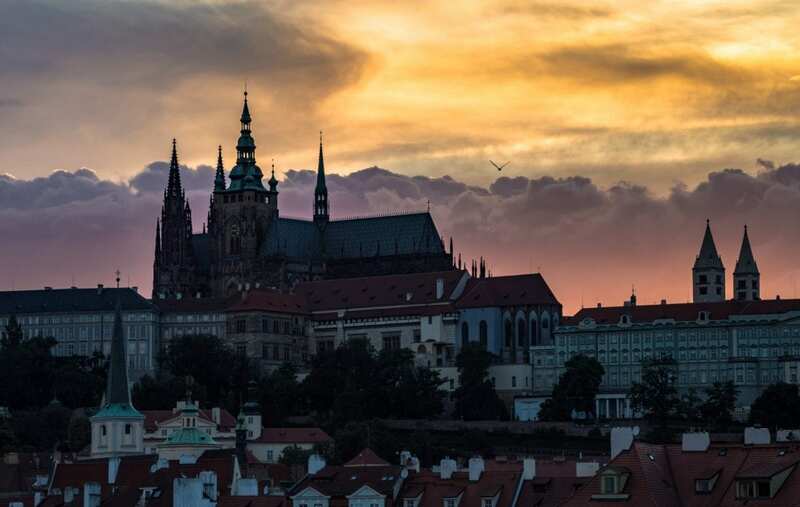 You’ll find spires adorning the rooftops all across the city, and not just in the most commonly visited center of Prague. 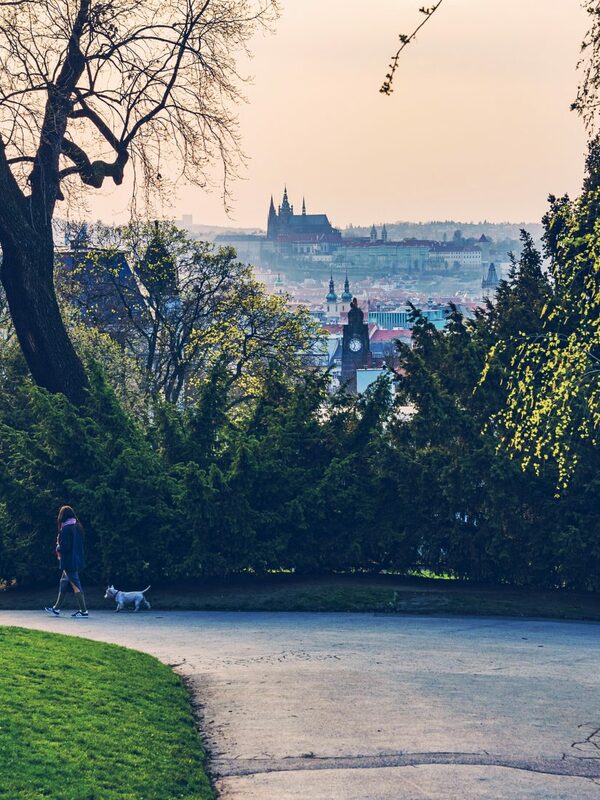 Venture off the beaten path and you’ll soon discover that Prague is even more beautiful that you thought. 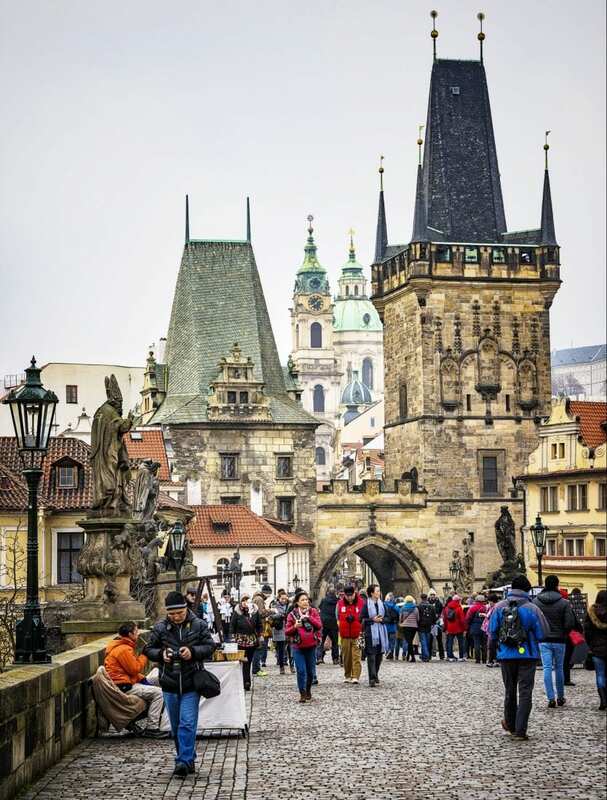 In our travel guide to Prague we called the city “Disney Land for Grown Ups”. One of our favorite spots in the city is the Naplavka river-walk. Spring, Summer, or Fall this is a great place to stroll during the day, and to partake in revelry at night. 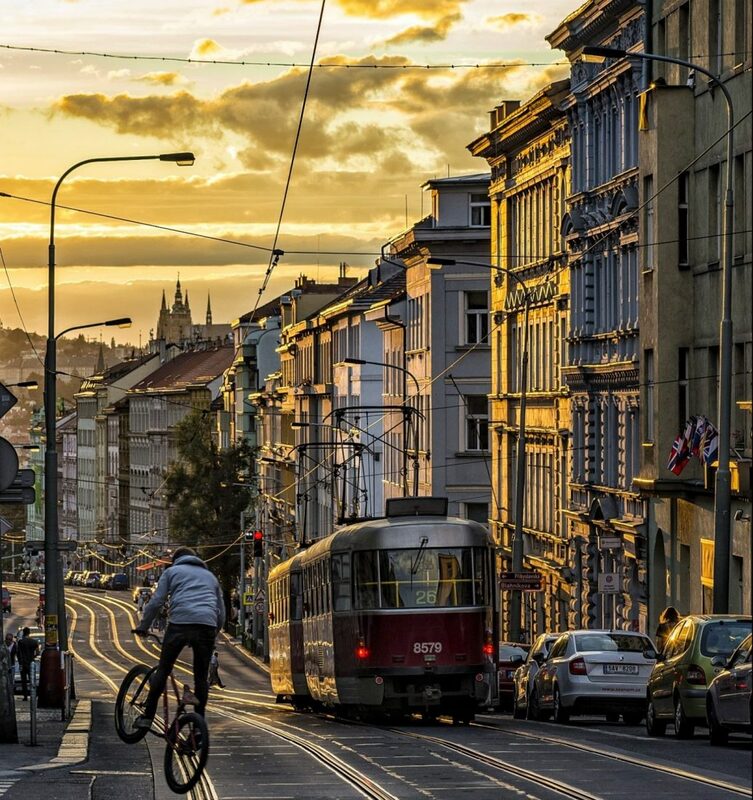 Ahhhh, Prague…we live for your sunsets. For most of the year the sun sets behind Prague Castle, as viewed from the Charles Bridge. 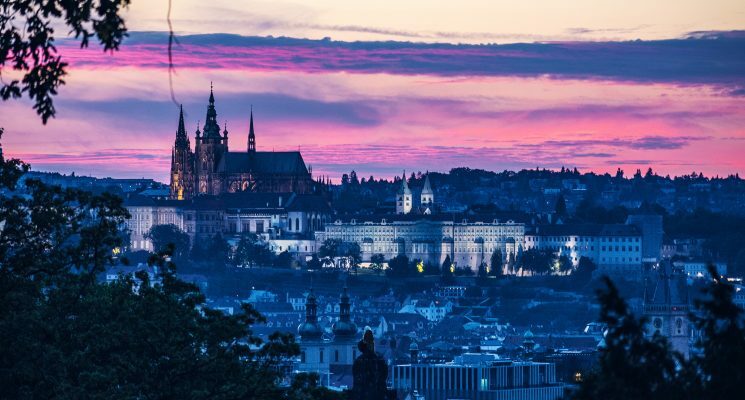 Often, in the warmer months, the sun salutes the City of a Hundred Spires with gorgeous red, pink, orange, and purple hues before stepping out for the night. …and a sunset in golden sky fire, both seen from one of our favorite little spots in Riegrovy Sady. We are not huge fans of winter. It’s nice for a couple of weeks, but all in all we prefer to be warm, basking in golden sunlight. Central European winters tend to be long, grey, and wet. The days are short, and the sun rarely comes out to say hello. It’s like that in Prague pretty often in the winter, but then sometimes it snows. 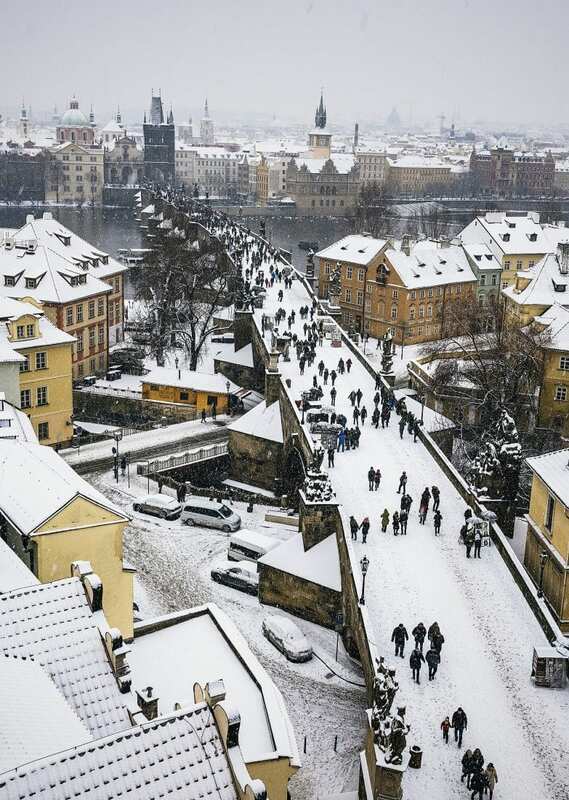 And when it snows… well, Prague gets even prettier. 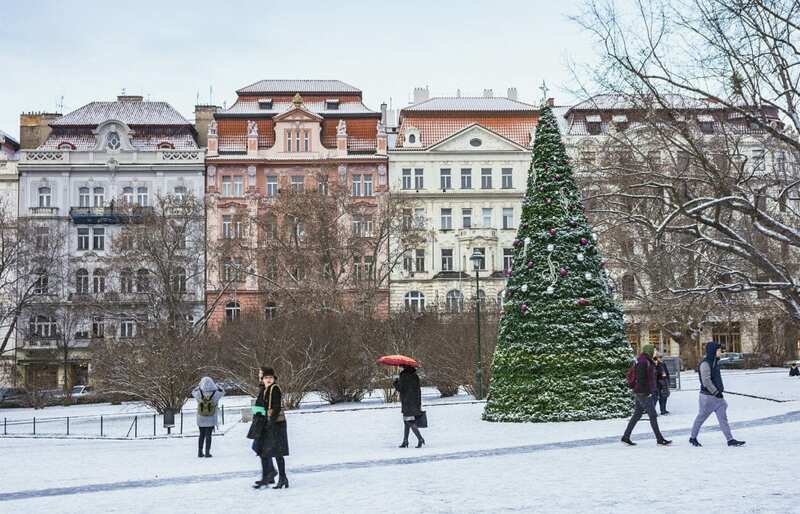 Such as this gorgeous white Christmas scene in Namesti Miru. This intimate square is one of our favorite public places outside of the center in Prague. Although locals will tell you that Namesti Miru is technically IN the center most tourists never visit this part of town. You should totally check out Namesti Miru when you visit. 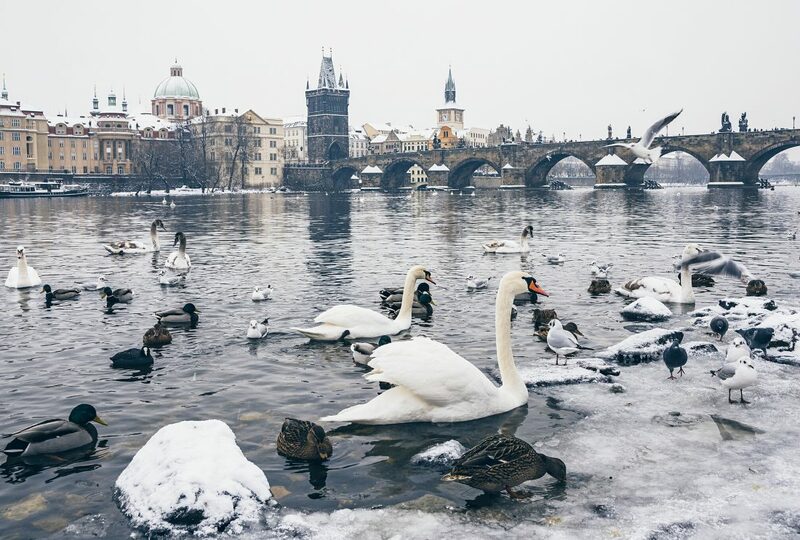 These swans, are just hanging out near the Charles Bridge, seemingly enjoying the snow fall too. An already enchanting stroll becomes even more spectacular. 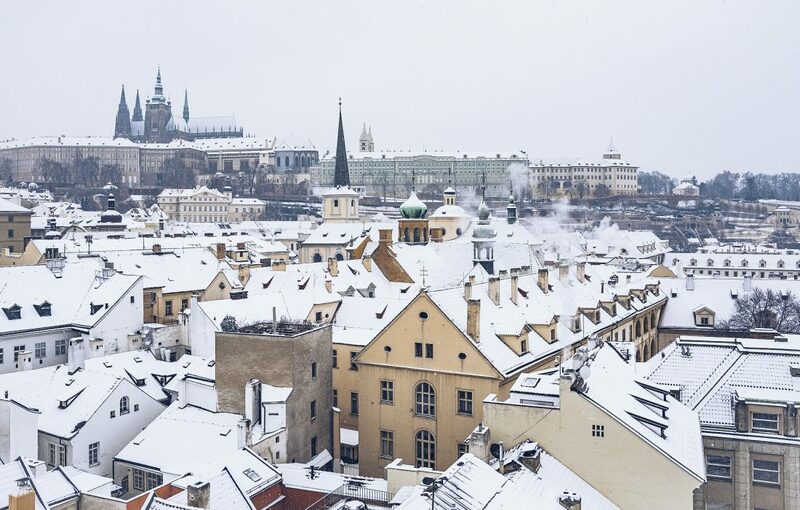 Check out our photo tour of a snow day in Prague for more of this amazing city covered in a blanket of fresh snow. 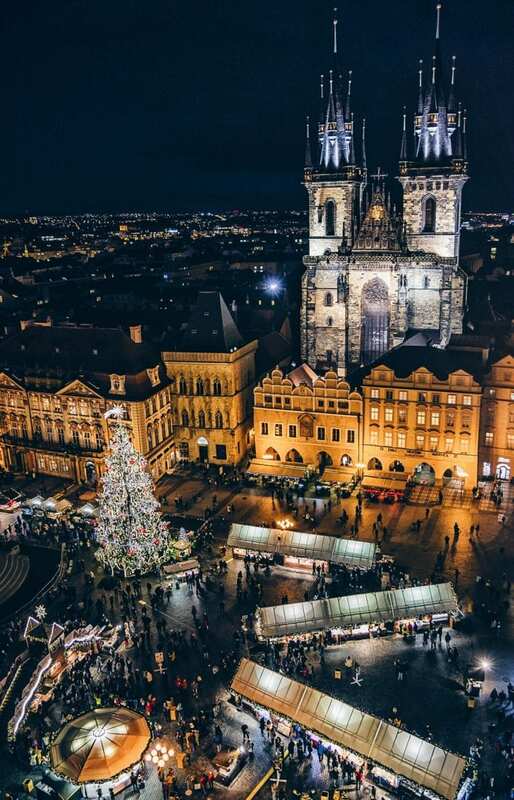 The month leading up to Christmas is as merry and jovial as can be all around the city, as the famous Prague Christmas markets come to life. 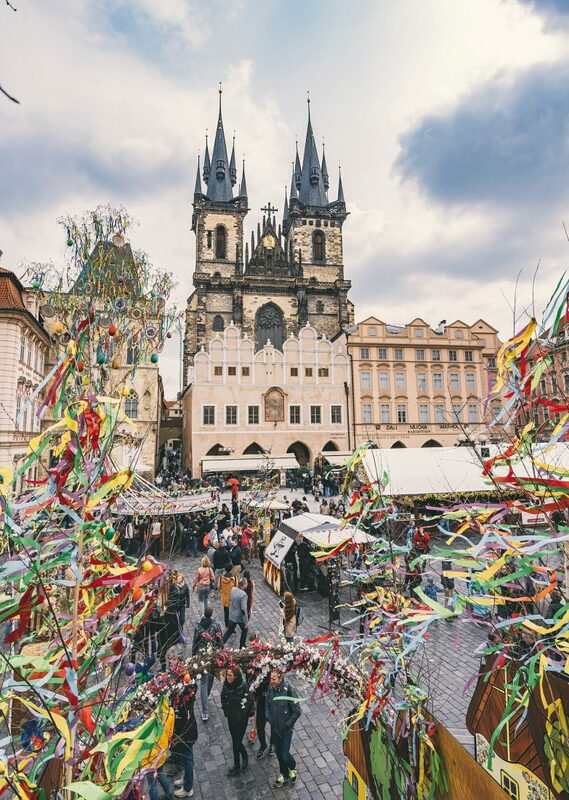 This market in Prague’s Old Town Square was lively each and every day in December, making the start of winter much easier to bear. 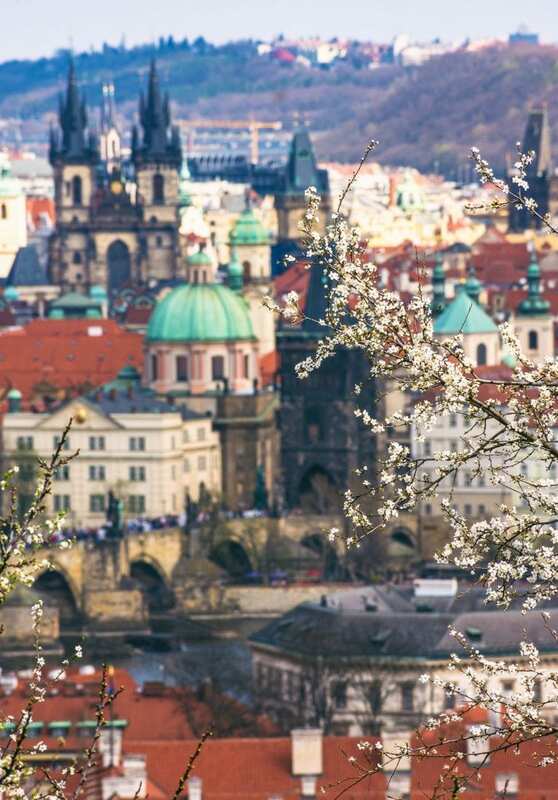 So, have we convinced you to visit Prague yet? Is so, you should hurry. Prague is sort of starting to trend as a destination for both tourists and ex-pats, and the city is changing pretty rapidly. However, it’s still affordable, even though the housing market is a tad out of control. 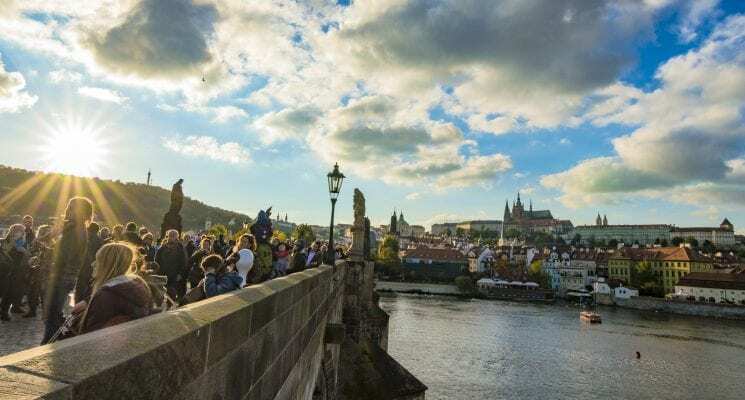 Prague can be a great destination for backpackers and budget travelers, and can be explored for about $30 a day and less if you are smart about it. 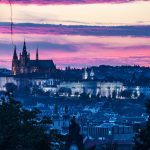 The same things that make Prague great for backpackers also make it a wonderful destination for digital nomads. 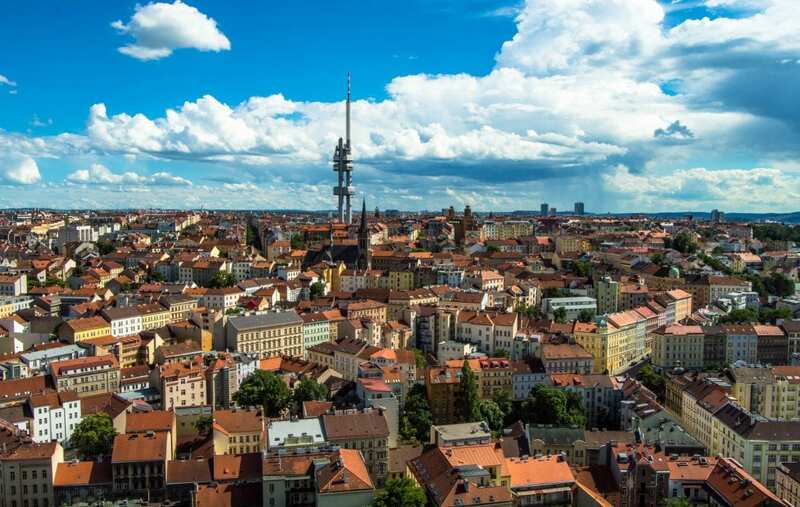 There are a growing number of them in Prague these days as well, pushing the city towards an interesting new direction, one that not all locals are thrilled about. Anyway, budget traveler or not, you should visit Prague. As soon as possible. We think, that by now, you agree. 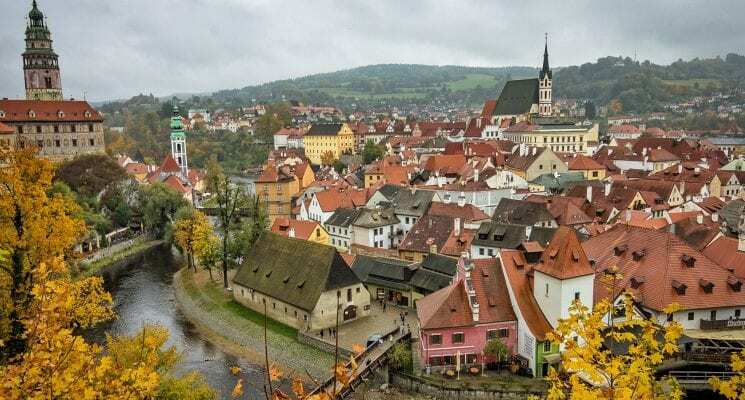 Want to See More of the Czech Republic? Definitely one of my favorite cities in the world. Looking forward to getting back someday. I thought about moving there to teach English a couple years ago, but ended up going a different route. Such a beautiful city though, and for some reason I feel like I’ll find myself back there soon. I taught English there for four years – amazing experience – great memories. I visit friends there every other year. Such a rich part of my life! I was born and raised in New York City. This is now year 5 living in Prague! Are you still in Prague. What do you dofor work ? Considering moving there in the next few years. Was there for 2 weeks in 2014 & totally fell in love with the city. One tick off my bucket list but definitely worth a return visit! Beautiful panoramic shots of Prague!!! I love that city!!! Wow wow wow wow wow! I’m convinced….I better start packing! Will be on my next travel destination. I visited Prague in Feb 2015 and all those memories came right back while seeing these photos. Certainly, one of the most beautiful cities. And I must mention, the warm and welcoming nature of the Czechs. A must visit! Nice pictures! True, the city really has it all and defnitely is a great place to visit and to live as I can see. Where beer is cheaper than water :)Thanks for the inspiration, time to get back there again. We were in Prague in 1996 ! What a beautiful city and what an experience ! Loved every minute of it ! I lived in mystical Prague from 2005 to 2011. Best years of my life without a doubt. The richest experiences, profound learning, unforgettable inspirations.. OMG I must go back one day. Now I live in Lisbon, Portugal, which is special in many ways too. But Prague is absolutely unique!. Michael and I will be in Lisbon at the end of January. Any tips for us? Wonderful pictures…I am am American living in Romania…I am also an artist…when is the best season to visit Prague? I am a Plein Air painter so I like to paint on location…also interested in locations and good places to stay. Interesting time to be an expat in Romania, to say the least. We love Romania and its people and wish them all the best in ridding themselves of the cancer that is their corrupt political system. On to Prague, we have a fairly large amount of content from Prague and the Czech Republic. The best time to come is either in mid spring (late Aprilish) or late September till the end of October if you want to see some beautiful fall foliage. Here are some articles that might be of help to you. April is known as the most unreliable month in the year in terms of weather. Our official last frost date is in mid-May and second part of May and early June are by far the best. Everything blooms at that time too. Then, as you say, September. I love Czech Republic…all of my family is there except one brother, mother and daughter and grand daughter who are here. I was there last year and these photos make me want to go back. Dear just-a-pack, thanks for your beautiful photos. Yes, you have. I shall definitely visit Prague as soon as possible. Agreed. Those are stunning photos, but the experience is much more intense. Born and raised in Prague, I tend to take it for granted. At times, I don’t go downtown for weeks! These pictures made me realize what it’s like for a tourist to see this city today – colorful, busy, even friendly (though that one is definitely with an asterisk). So different from the polluted, broken-down Prague of my childhood. Today’s Czechs tend to know how to live well, but don’t know that they do. We love to complain, but really, there’s not much to complain about. Quality of life is high, in fact much higher than in many countries, including, for example, the US. One thing is the statistics, the other an actual experience and the overall accessibility of amenities and benefits, which is still quite high – everything that matters to ordinary people is actually free or affordable – health care, education, public transport, etc. 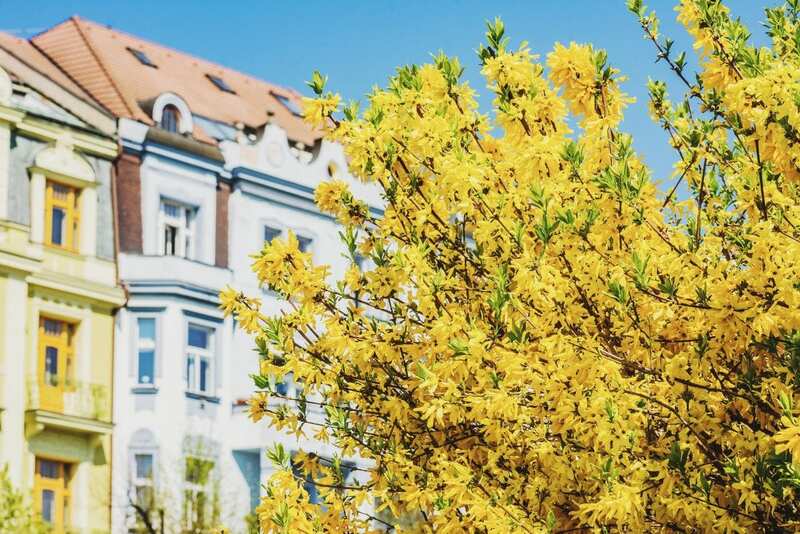 For Czechs, the rents are very high, but not so much for foreigners. Just one note – those snowy photos are romantic, but we have virtually no snow in the past few winters. Maybe for a week or something. But Christmas is fun to offset some of it and then the magic of spring happens! It’s well worth waiting for. We go to Prague for two weeks every January. My wife is of Bohemian descent. Wonderful city. Great to take day trips to neighboring towns and cities. Friendly people, great food, very affordable, and great beer. The Czech people are fantastic. I have read something like 660 towers and spires …. Wish we had more time on our vacation to spend in Prague, but from what time we had we enjoyed every moment of it. Prague is beautiful, and the locals so friendly and helpful.